The spectacular gingerbread scrollwork (also called fretwork) presented by our wood Fretwork Panels and gingerbread Fretwork Medallions is worthy of a prominent position in your decorating plans! Panels and Medallions can be used for both exterior and interior projects. Our wooden antique-style Victorian gingerbread scrollwork Panels and Medallions are available in a variety of designs including oval, circular, floral, and shell motif. The photo at right shows the Shell Medallion used on side light. 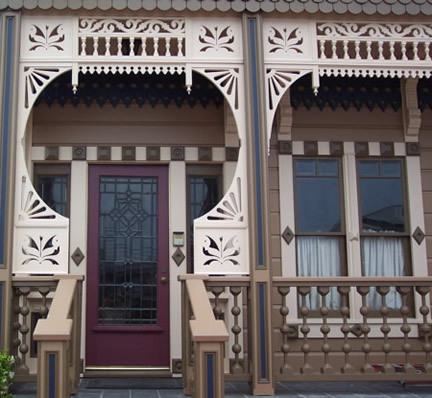 Medallions can also be used to create extraordinary Victorian-style porches! The porch at right features Tulip Medallions on either side of each Porch Post, together with other components from Vintage Woodworks to create a true masterpiece in the grand style of the past! The overall design, balance, and execution is very much in keeping with the finest examples of the past century, when porches approached the status of an art form! Click photo above for more views and information. Tulip Medallions are again used on the porch at left, but this time they are skillfully combined with other components to create a fantastic circular porch entrance. While not often seen anymore, the circular porch entrance was fairly common during the golden age of Victorian architecture. Click photo at left for additional view and information. 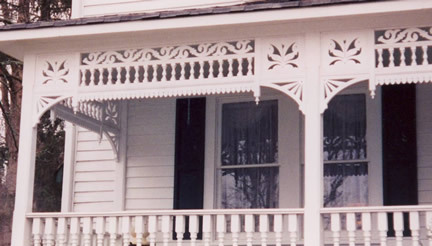 Fretwork Panels can easily add Victorian flair when decorating. The parlor entry at right benefits greatly from a Queen Victoria Fretwork Panel set into the transom above door and sidelights. Even commercial buildings can have lovely entries, as this Queen Victoria Panel clearly illustrates. We also have Ceiling Medallions.